Here is my performance of Solo #1, Queen’s We Will Rock You. I have said before that my criteria for “completing” a solo is whether I would feel comfortable playing the solo live in front of an audience, and I feel I’ve satisfied that requirement. 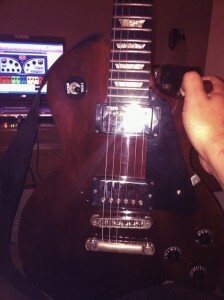 I’m never going to be able to play it as well as Brian May, but that was never my goal. I probably should have picked an easier solo to begin with. My goal was to start with fairly easy solos to build my confidence going into the harder ones. I thought this one wouldn’t be bad, and chose it mainly for it’s symbolism, but there are some pretty tough parts. My index finger is really freaking sore. This solo makes heavy use of bar chords, especially the high A, and man does it wear out the index finger. There are some intricate details that I’m sure I’ve overlooked. I could probably work another month on it and have everything better… but it still wouldn’t be perfect and if I shoot for perfection, I’ll never get through this. I feel like I captured the essence of the solo. Listen to the song first. 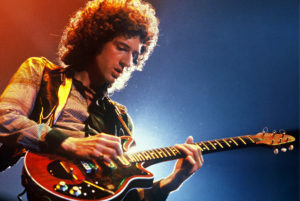 This is a replica of Brian May’s “Red Special”, a hand-made guitar that he and his father constructed in 1963. There’s an excellent article about it’s construction on Wikipedia. He used it to play probably the most well-known rock guitar solo ever recorded, the blistering last 41 seconds of We Will Rock You. I remember sitting in our family room, shortly after we had moved to Texas. It must have been sometime in 1979, and my Dad was putting a record on. He handed me the cover of the album he was about to play. It was a painting of a confused-looking giant robot apparently murdering the members of the band as they dangled from his hand. Not particularly shocking these days, but I remember thinking of it as exotic and cool. Then I heard We Will Rock You for the first time. The tribal beat and raw, stream-of-consciousness vocals were unlike anything I’d heard before. Behind the final chorus grew a single resonant note, building with the vocal crescendo, and evolving into a raunchy solo that was so tight and perfect, while at the same time reckless and raw. I listened to that song over and over again as a kid. Later, the chorus of the song became a cliché, to be banished to the purgatory of professional sporting events, with AC/DC and Bachman Turner Overdrive. But the solo has always remained separate and beyond reproach, rarely played and yet always remaining shocking in it’s simplicity and uniqueness. I picked this as my first solo to learn not because it’s the easiest, but because it represents the perfect beginning to this project — an homage to one of my favorite bands and their amazing guitarist, Brian May. And I picked it because it’s short. Here’s a girl playing the solo very well. She says it’s the first solo she learned, and she’s got a full YouTube channel of solos that’s she’s covered. The original music video. Classic Freddie Mercury in star-shaped shades. Queen performing it live at Wembley Stadium in 1986. 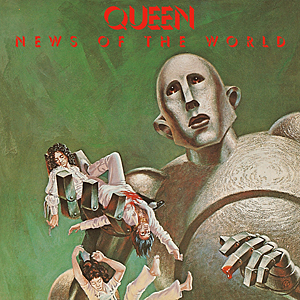 Note Brian May’s extended solo at the end. I will not be learning this version.